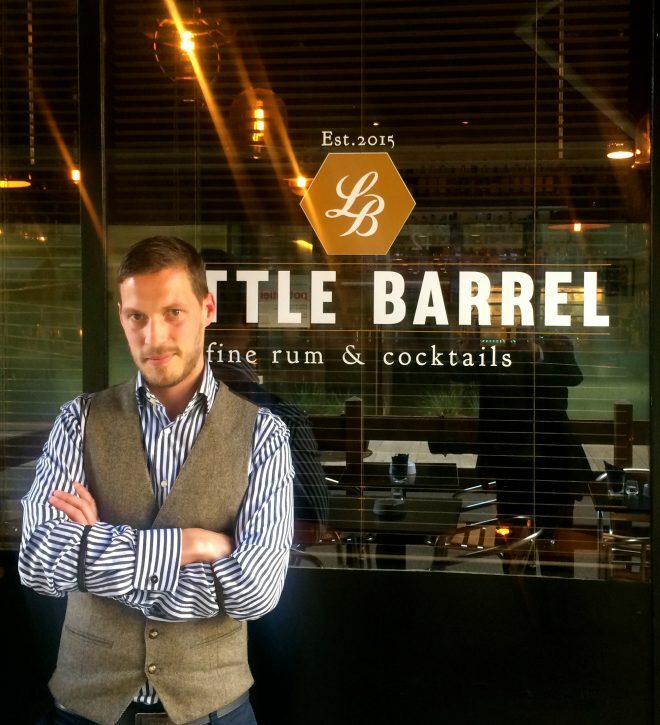 Hi I’m Quentin Beurgaud, co-owner and bartender at Little Barrel in Geneva. Like most of the guys in this industry, I began my career by chance ten years ago. I was an accountant student and in summer I started a job as a waiter in a restaurant. I’ve done it for several year. Then I worked behind the bar in a casino as an apprentice where I learnt how to make most of the classic long drinks. After that, I moved in small cocktail bar before going in a restaurant bar lounge, named Quirinal, where I really learnt a lot about cocktails and flair bartending. So I decided to study a lot about cocktails, reading books, watching interviews met other bartenders… I had the chance to become the manager of another cocktail bar, l’Apothicaire Cocktail Club. The bosses really trusted me for this position, thanks a lot to them. I started contests, try to be more and more accurate and I began to make a name on the Geneva’s cocktail scene. To open your own place you need to be graduated, so I did it and now here we are at Little Barrel for nearly a year now. I opened it with my co-founder Nicolas Berger, former head bartender at Chat Noir. There are more and more cocktail bars in Geneva, so we wanted to open a place with a main spirit that you can drink neat or in a cocktail, it was the rum. With no limits our bar would look different : design, spirits range… When you start you have a small budget so you have to go through main providers to close deals and you can’t have all the spirits you wanted. For instance even if rum would be central, we would have more different type of spirits. As well you can seat 45 fo 60 people, a bigger place would have been nice with 80 persons and 3 bar stations. But with no limit, the possibility to serve food would have been a real plus, otherwise you loose you clients at diner time. So food but of course pairing, because that the interest too of mixology. We would keep two different ambiance, one where is the bar with more fun and loud funky music and a second one, more cosy, speakeasy style, where you can chat quietly and taste your drink in a jazzy ambiance. This second space would manage its own bar with sharper cocktails and more premium spirits. My job is my life, so even when I am off, I go to other bars to see, ask, learn and meet other bartenders. It’s part as well of the network you need to manage. Else I practice a lot of sports. I went to Cuba so I have a special relationship to rum and a lot of memories from there. That’s why I’ve participated several time to the Havana Grand Prix. The history and universe of rum speak to me: the travel with the sugar cane originally from India, the slavery, the Caribbean and sea and the sun… Rum has a big range of flavours, and you can easily mix it with different juice and it’s easy to work in cocktails. My favorite rum comes from Panama it’s Zafra 21 years old, and I think it’s as fine as a good cognac. Now I am moving to mezcal and tequila (I am graduated from the Mexican state to promote and use Tequila ) which I think will be the next big thing here in Geneva. A good cocktail is about balance, products and the way you perform it : which flavour you want to push, the spirit selected, its name and the way you serve it. I love vermouth and I love bitter cocktail. Geneva is near Italy and near Chambery where I’ve visited the Dolin’s manufactury so I am really attached to it, especially the red one. In Italy I’ve try a lot of vermouth, and you can drink it neat. But in cocktails it can give a vegetal or fruity taste with spice. I love too make them macerate before the mix in a dry cocktail. In Geneva you should go to meet my former bosses at l’Atelier Cocktail Club, I’ve learnt a lot with them during four years. Barbershop is a place to go too, that’s where I learnt flair bartending. Don’t forget the Geneva Cocktail Week which begins the 29th of August, so you can meet Quentin and many other bartenders in Geneva.